It is difficult to say that China is one way or another based on one person’s point of view. I can only relay what I’ve experienced, seen, felt, heard, smelt, and tasted and I can’t make grand generalizations with my observations. So while I can’t say what all Chinese hospitals are like, I can tell you about my trip to the Tianjin First Central Hospital which felt vastly different from American hospitals. Without getting into too much boring personal detail, I had to go to the hospital this past Tuesday to see a doctor because my toe was swollen and purple because of a toenail growing into my skin. My foot had gotten to a point where it would throb painfully all the time, and I had no choice but to make a trip to the hospital. I arrived at around 4 p.m. and the hospital closes, except for the emergency room, at 5 p.m. Although there were a lot of people, my Chinese teacher who accompanied me remarked that this was much better than in the morning. The hospital opens for business at 6 a.m. and it sounds comparatively much more hectic. First, I entered in and my teacher and I waited in the registration line. 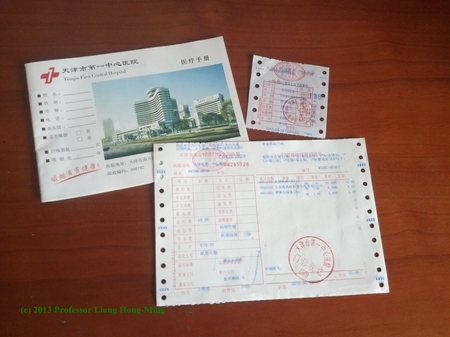 I registered and paid five yuan to register (less than $1). Next, I waited in a waiting room for approximately 30 seconds before my name popped up on the TV screen directing me to a doctor’s room. Completely unfamiliar with my surroundings, my teacher did most of the talking and interpreted for me, explaining what was going on. The doctor was talking to a woman holding a prescription when we entered the room. My teacher went straight up the doctor and explained about my foot. He asked me to sit down and wait. He continued to talk to the woman, pulling up her chart on the computer, when a few more people walked in to the small room also holding prescriptions. My teacher explained that these were patients who had just gotten prescriptions for medicine and needed to ask the doctor how to properly use them. A few more people came in, then a few more, until about a dozen people occupied the little room. I was not sure if I was in the way, or if this was even an official “appointment” like I’m used to in the U.S.A., but my teacher must have seen my discomfort. She reassured me that everyone was just comfortable with a lot of people. I’m accustomed to the privacy of an appointment with a doctor, when they direct all their attention to one patient at a time. Privacy didn’t seem to be a top priority at the hospital. Still, after about ten minutes, the doctor was so busy that he sent us straight to surgery. A nurse glanced at my foot, decided what needed to be done, and set us back to the registration line to pay. In my opinion, this is the biggest difference between American hospitals and Chinese hospitals. In Chinese hospitals, you need to pay for whatever treatment you need before you receive it including medicines and any operations. I paid only twenty yuan (just over $3) and went back to the surgery. As it was nearing the end of the work day, I was the only patient there. All that happened next happened in about 2 minutes. They had me it on a hospital bed, prop my foot up, and told me to look the other way. Without going into detail, two nurses fixed my foot with small instruments like tweezers and small knifes. The whole process was quick and efficient, though I would’ve preferred they use some sort of numbing medicine or at least warn me before they cut my foot. I really shouldn’t complain, because as I write this two days later, my foot is much better. I left the hospital around 5 p.m. with a wrapped up toe and a lot of new knowledge about this unfamiliar facet of culture. Efficiency appears to be the top priority, which makes sense because of the sheer number of patients, and all the workers were very forward. People need to pay for all their treatment and medicines before they receive them, and I also learned that people don’t take lines/queues very seriously. All and all, my trip to the hospital was very interesting and beneficial for expanding my knowledge of China, my understanding of typical behavior in hospitals, and most importantly, my big toe.